The other day I picked up a new book and began reading. Well you know how it is with a new book, I couldn’t put it down. It’s actually cost me quite a bit of time that would otherwise have been used on production and budget work. Ultimately it was well worth it as the information I’ve absorbed will be of great help throughout the process. I now have a much better handle on the process and various jobs involved in producing a documentary. I learned a fair bit about story structure and script writing while in school in Phoenix but while reading this book I suddenly realized I didn’t know nearly what I thought I did. So I’ve set to work learning more about the entire process and it is daunting. Sometimes I think to myself, people go to school for years to learn this stuff, what hope do I have of understanding it by myself with my limited time frame. I have to try not to get bogged down in that type of thing, I do have a deadline and I may not be able to do things perfectly but I still feel I’m going to be able to produce something that looks good and conveys the message we want it to. Whats the book that spawned this thought train off a sheer cliff you ask??? It’s The Documentary Film Makers Handbook: A Guerilla Guide by Genevieve Jolliffe and Andrew Zinnes. ISBN 978-1-4411-8367-5 It’s an excellent book with a wealth of information and viewpoints from numerous individuals in the form of interviews with professionals working in various aspects of the documentary film making process. It’s the type of book that will continue to bear fruit in our work for years, thanks to the list of contacts and services we can tap while working on our project. 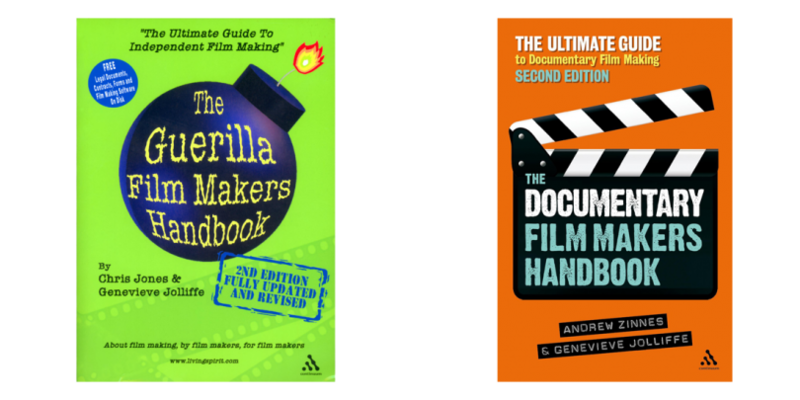 It’s part of series that begins with a book called The Guerilla Film Makers Handbook (All New American Edition) by Genevieve Jollifee and Chris Jones. ISBN 9780826414649 Which we’ve found to be equally helpful in familiarizing us with the process from the points of view of the Industry professionals. Because of the information I’ve been gleaning these last few days, thanks to these books, I’ve done a lot of overhauling of the story and structure of the documentary, not to mention the overall plan of execution. Hopefully you’ll be seeing some changes over the next few days on the areas of our website that involve those aspects of the project. Until then I hope you’ll bear with the lull in the frequency of my posts, comforted by the knowledge that it will all add up to a better, more expertly crafted final product.